We have been accused by an unnamed person on a website called the Olivet Journal, asserting the Eth Cepher is “blasphemous” among other miscellaneous accusations. First, we begin with the premise that the post is written anonymously, so this is how we will make reference. This is the sign of a person willing to spew harmful dialogue, but not willing to take responsibility for the comments. Accusing is the work of Satan; the accuser, the liar, and the murderer. But we will not make any such an accusation here. Instead, we will look at the substance of the charges and refute them systematically. The book is published by the Cepher Publishing Group. Penny and David are part of the group, but they did not do the compiling, interpreting, or editing. Those decisions were made by others. The author then goes on to say that calling the book “complete” is blasphemous. Quite a large word for a commentator who drops accusations without substantive merit. But let’s examine further the vacuity of the claim. The author claims we have added post-exilic kabbalistic books. This is patently false. First, I challenge Anonymous to list the post-exilic kabbalistic books in order, and to further point out when such books became post-exilic (and for that matter, the author can also set forth with particularity who “exiled” these books, and the criteria used to exile them, and when they were adopted by kabbalists, again setting forth with particularity the names of the kabbalists who adopted these books, when such adoption occurred, by what standards, and the writings that demonstrate that these books were adopted by kabbalists). Let’s take a moment here, however to discuss kabbalistic books. 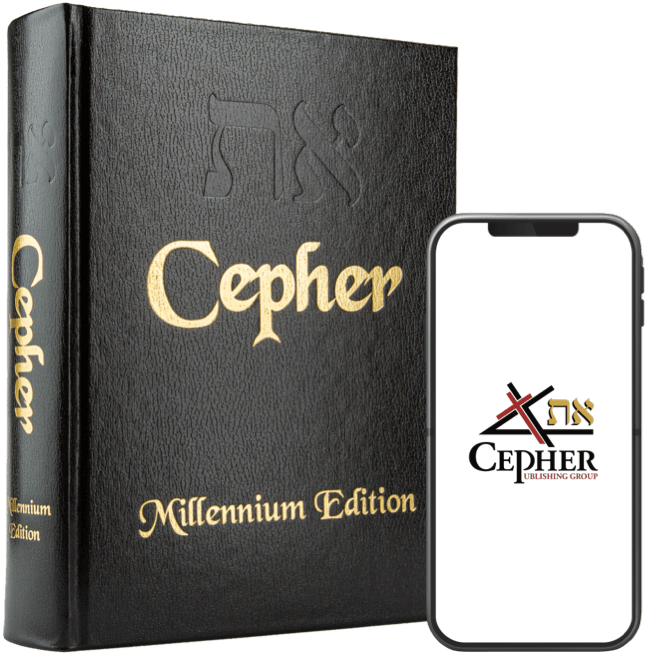 Without getting too far into it, suffice it so say that the center of kabbalah is found in the Cepher Ha’Bahir, the Cepher Yetzera, and the Zohar. Please review the table of contents in the Eth Cepher and see if you can find these books. Chanok and Yovheliym are simply not considered kabbalistic books. Instead, they gain substantial credibility from their prominence within the Dead Sea scrolls. The books are essentially Essene in substance; not kabbalah. The writer goes on to bear false witness that we have identified all of the books in the Eth Cepher as being consistent with the Roman canon. I have written on this topic extensively, and, since “canonization” is always a lively discussion, I will readdress the issue here. First of all, 66 books have never been “canonized.” Canonization means that the books have been named as part of a rule (“canon”) governing the Roman Catholic Church. It means nothing else. Therefore, the books accepted by Martin Luther, the books declared to be mainstream by the Westminster Confession, the books adopted by the Sanhedrin, the books adopted by the Coptics, the Asyriacs, Marcion, Eusibeus, Josephus, Justin Martyr, Clement, Thomas Aquinas, King James, King Henry, the Tsar, the Patriarch of the Eastern Orthodox church, or Calvin, cannot and are not Canonic. Those who insist that their bible be Canonic are merely carrying Roman Catholic water. Such people should be aware that the Roman Catholic Canon has always included the books of the Apocrypha. As late as 1867, the King James Bible – the centerpiece of modern Protestantism – contained one more book than the Catholic Bible in its Apocrypha. We can conclude therefore, that the author accusing us of being “blasphemous” concerning the books of the Canon, is ill-informed and under-educated on the subject. I think I understand the impetus of the statement however: we’re blasphemous because she is without knowledge. Well ... WHO decides what is incorrect and what is original ... in what authority? And, their standard seems to be the Judaic tradition, which is Kabbalah. I have a thing or two to say about every single item here ... but it will suffice to say they are all KABBALISTIC. The first part of this question is a good question: Who decides what is incorrect and what is original? Let’s start with that question. The Septuagint – the work of the seventy – was a book of the second century B.C. where seventy rabbis translated Hebrew “scriptures” into Greek. This book contained 47 books (cepheriym), many more than the 39 books found in the Tanakh. This collection was the collection later canonized by the Catholic Church as the Old Testament and Apocrypha after the church concluded the order in the Fifth Century. So, as to the Old Testament, the question of who decides is answered by the decision of 70 ancient rabbis. Next, who decides on the number of and the books in the New Testament? (Of course, the Eth Cepher does not distinguish between the Old Testament and the New Testament – it simply flows one into the other). Again, twenty-seven books appear in that portion traditionally recognized as the New Testament within the Eth Cepher, which is the same number of books and the same books identified in the Mauritorian fragment and the same list adopted and canonized by the church in 430 A.D. Okay, what remains are the books we decided to restore: 2 Baruk (Baruch), 3 & 4 Esdras, 3 & 4 Makkabiym, Chanok (Enoch), Yovheliym (Jubilees) and Yashar (Jashar). We discuss the additions of these books at length in the preface of the text, which I will not belabor here. Our reasons for inclusion are set forth there as well. 3 & 4 Makkabiym (Maccabees) were not written at the time of the drafting of the Septuagint, which may explain their omission. 2 Baruk and 4 Ezra, once read, will make it clear why the books were abandoned by the Yahudiym (too many accurate references to the coming Messiah); and why they were abandoned by the Christian church (too many references to the keeping of the Torah). This leaves Chanok, Yovheliym and Yashar. Chanok was denounced by one of the founders of kabbalah, namely Yochai, as heresy. I will not reference Yochai as a rabbi, and denounce his mishneh formerly here. Chanok survived repeated attempts to destroy it for over two thousand years, which speaks volumes about the will of YAH concerning its survival. In addition, the book refutes a central tenet of emerging pagan theology – that mankind was genetically manipulated by elohiym (the gods) to create modern man as a species, and does so by laying an historic record which clarifies that man was here first before the watchers inbred. Yovheliym was very definitely part of the roster of books of the Coptic and Asyriac church and has been included in Eastern Orthodox lists as well. Yashar was by far our biggest risk, yet we believe it to be a worthy text for inclusion. Speaking of this issue: our policy in developing this Eth Cepher was to be inclusive, and not exclusive. There are hundreds of commentators who demand that this verse, or that verse, be deleted from the gospels, from the epistles, and so forth. One commentator insists that all of the references to Christ were added as pseudepigraphal writings and has demanded their exclusion. Another group reached the conclusion that the only actual words of MASHIACH were the words constituting that text known as the Our Father (Lord’s Prayer). There are others who argue for the exclusion of the works of Paul (Sha’ul) because of their unreliability in ascertaining authorship. Lucas should go, and the book of Acts with it, say some. Hebrews (Ivriym) is completely unreliable, and its authorship is questioned, we have read. Some claim that 2 Peter (Kepha Sheniy) is a forgery; others claim all of the epistles are forged. Some claim there is only one synoptic gospel, and the others were copies. Should we give credence to all of these criticisms, the entirety of the New Testament would be removed. We elected to publish the twenty-seven (and we did include the 29th chapter of Ma’aseh (the book of Acts)). Although we reviewed many other texts, and epistles, and other writings, including the gnostic collection, these books were not included. As to that portion of the book formerly known as the Old Testament, we looked at many books such as the Testimony of the Twelve Patriarchs, the Ascension of Isaiah, the Apocalypse of Mosheh, the Apocalypse of Avraham and other books which we elected not to include. Let’s look at the next claim made by Anonymous. Second, her YouTube user name "NotzrimWoman" ... is a very kabbalistic name. Notzrim Woman is a derivation on the term Nazarene, which is sometimes also called Netzeriym. The term netzer is a Hebrew word meaning “branch” and the Netzeriym was the name adopted by the early followers of HAMASHIACH. This is based on the verse “I am the vine, you are the branches.” In Hebrew, Ani ha’geffen, atah ha’netzeriym. Once again, Notzrim is not a kabbalistic name, but a name totally consistent with a Hebrew roots understanding of scripture and the gospels. Calling the name kabbalistic is simply an argument ad hominem. The argument ad hominem is a logical fallacy and is usually deployed when there is a complete lack of substantive merit. Such is the case here, as the accusation is unwarranted, unsubstantiated, fallacious, and incorrect. Before we start into this, let me clarify that I am the one who originally set forth the design idea for this logo, so I know exactly what the logo is about. Anonymous exhibits unbridled quackery and assumptive intellectual regurgitation in the comments about this logo. No one at the Cepher Publishing Group is a Mason or a Satanist. Making such an accusation is bearing false witness. Anonymous can make an argument before the White Throne on this one. And YAHUAH said unto him, Go through the midst of the city, through the midst of Jerusalem, and set a mark (tav) upon the foreheads of the men that sigh and that cry for all the abominations that be done in the midst thereof. It would help if this critic actually read the Eth Cepher before reviewing it, but there is no accounting for commentary on the web. So I will render the following counter advice to Anonymous: Get the heck out of our Web site, and read the Eth Cepher; in particular, read those books that you fear the most. You will absolutely love 4 Ezra, and 2 Baruk (Baruch). Yovheliym will answer so many questions that you have about the beginning of things, and Yashar is a great read. After you have read these books, let’s have another discussion. Until then, shame on you for bearing false witness. We forgive easily, however, so until we meet again, blessings on you and your household. May you be blessed with the in-presence of the RUACH HAQODESH, the grace of HAMASHIACH, and the love of YAHUAH.